The following information came to me from Suzette Boisselle. Please read and please give all your positive thoughts and prayers to Tristanne, her husband and their family. Thanks! I wanted to let you know that Tristanne Childress is in great need of our prayers. Her husband, Ed , called me yesterday from Carolinas Medical Center in Charlotte where Tristanne is in intensive care. Tristanne contracted the flu, which turned into pneumonia. She was airlifted to Charlotte on Wednesday, March 5 as there were no intensive care beds in our area hospitals. Yesterday, when Ed called,the doctors were in the process of inserting a trach tube to respirate her. Her respiration rate was too high for any oxygen transfer to take place in her lungs which is essential in keeping your entire body functioning properly. We all know Tristanne as a strong woman, dedicated to those around her. She is a fighter and we are counting on this spirit to bring her through this grave medical situation. Ed is so worried about her. In talking with him yesterday, my heart broke. Ed is travelling back and forth to Charlotte on a daily basis. Because she is in intensive care, we cannot get a status. He said he would keep me informed of her status. I told him I was going to share this information and he wanted everyone to pray for her. I will keep this distribution list updated and you feel free to extend this message out to the horse community. Tristanne and Ed will need our help in the days to come. My prayers go out to Tristanne. What tragic news. My heart goes out to her family. I remember Tristan as a teenager showing at Wheatstate. 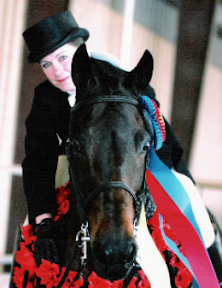 The Morgan horse world has lost a special person. OMG!!!! I had my horse with Tristanne while she was at Flintlock — my heart is truly broken. Any more details — will there be a service memorials? Suzette Boisselle has informed me that a tribute page for Tristanne is being set up at Virginia Carolinas Morgan Horse Club website. A scholarship fund is also being established in her name as she was a strong supporter of the youth program. She will pass along the information once it has been put into place. Email notes and thoughts can be passed along through Suzette Boisselle and Pete Jaeger of the VCMHA. I believe this information will also be posted on the VCMHA website. Tristanne brought a lot of joy and laughter to our lives through her love of Morgans. Her expertise and motivation will be missed and impossible to match. We are so sad to learn of Tristanne’s passing and offer our deepest sympathy to Tristanne’s husband, Ed, and the Carolina-Virginia Morgan Horse Club family. The following message is from Pete Jaeger, the 2008 AMHA Man of the Year. My prayers are with Tristanne’s family. She was always a smiling face at the shows. She was kind to all, whether they had a horse in her barn or not. I truly admired her and her contribution to both the VCMHC and the Morgan breed as a whole. I always remember her fondly. The AMHA website has a very nice write up of Tristanne’s life and accomplishments. As a past Chairman of the USET Young Riders Committee, I know how important training and support of all kinds are to our youth and upcoming competitors. Tristanne Weber Childress’ involvement and nurturing of the youth in your program will leave an indelible mark for future champions. My heart goes out to all her friends, colleagues and especially, to her parents. The horse world has lost a true champion.